Slow growth inland Douglas Fir yields fine-grained, smooth faces. 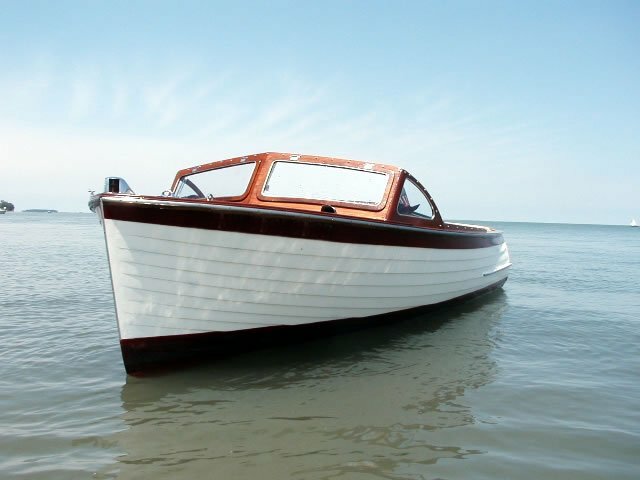 AB marine grade Douglas Fir plywood is frequently used for lapstrakes and hull planking on wood boats. Both faces are smooth with no open knots on either side. Pressure treated BC or STK CC Grade Douglas Fir is great for use under carpeting where rot and fungus resistance is required. It is used extensively as decking on house boats but also works great for horse and equipment trailers. Due to recent changes in the freight industry, our website is currently not able to provide accurate freight prices. Most freight prices on our shopping cart are for residential delivery and are at higher rates than available. We normally can lower the freight price, especially for commercial delivery or for pick up at the freight terminal. There is a minimum freight/crate price for a small quantity of plywood of $190 ($95 freight +$95 crate) for midwest US delivery to a full commercial address or pick up at the freight terminal. Most shipments are at least $250-$300 freight/crate. Please contact us by phone or email or enter your complete info into the shopping cart with a note to check freight price. Please note if business delivery and name of business and if you have a forklift. Thank you. can be combined with other plywood species and thicknesses to get discount. B and better face grade with no open holes or defects. Splits over 1/32" are filled. Only sound, tigh pin knots are allowed. Back has a 1 piece rotary cut high C grade chosen for minimal knot holes and splits. Back is touch sanded with 60 grit paper. Inner and outer plies can be Douglas Fir or Western Larch both sold as Douglas Fir. To generate an immediate quote including shipping please use our online shopping cart. -To generate an immediate quote including shipping please use our online shopping cart.